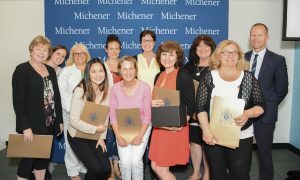 On July 4, 2017, Michener staff and faculty gathered for the Annual Staff Awards to celebrate excellence and recognize employees who exemplify UHN’s Purpose, Values and Principles. The Award for Innovation recognizes individual and team initiatives that further one or more of UHN’s Propose, Values and Principles. The winner this year was Megan Marshall. Nominated by Alex Gontar, Megan received this award for guiding Alex through a number of very easy but very effective changes to the learning experience in the courses that he teaches. In his nomination letter, Alex wrote that not only will these changes have a major impact on student learning, but that through the help of the recipient of this award, Alex’s passion for helping Michener’s students learn has been reinvigorated. 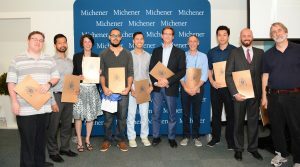 The Interprofessional Collaboration award recognizes teams that work together to achieve Michener’s academic vision and to support our students’ success. This year the award goes to the CT Scanner Replacement Team for coordinating a suite of projects that involved extensive work setting up the right software, designing the student lab and connecting the CT scanner. Congratulations to: Henry Kong, Roberto Cardenas, Ross Woodruff, Mario Zhu, Tim Chipman, Marc Potvin, Nicholas Yim, Roger Webb, Dominick Myers and Monique Barbeau. Denis Poulin and Caroline Souter attended the ceremony to present their award, the Denis Poulin & Caroline Souter Faculty Award. 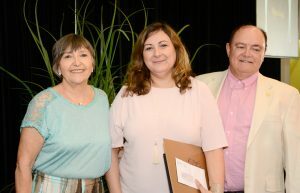 They generously created the award to honour an individual faculty member who has demonstrated an outstanding commitment to students and the Michener community. 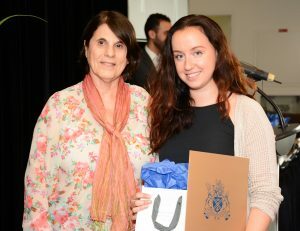 This year’s recipient was Maria Boyd for her dedication, support and commitment to her students and raising the profile of Michener’s Magnetic Resonance Imaging program throughout the industry. The Resource Innovation Award is given to those who seek out and leverage every opportunity to maximize the effective utilization of resources – financial, human, physical or time – and helps build a culture for developing innovative ideas. 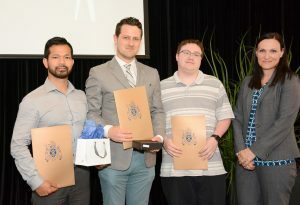 The award was submitted for the Information Management Team made up of Henry Kong, Ross Woodruff and Alex Dahl, who completed the UHN and Michener technical integration project in Fall 2016 in spite of a large mandate, technical challenges and a short timeline. The project mandate was ambitious: open UHN email, intranet and other collaborative resources to staff, faculty and students in a manner that maximized the benefits. Numerous staff and students commented positively and are using the UHN resources that have opened up as a result of this project. The integration became one of the technical building blocks that enabled seamless collaboration between all education portfolios across all of our campuses. The Mentoring Award recognizes Michener employees who have contributed to the personal or professional development of another employee through mentoring. The recipient of the award is Sean Morphy, who constantly goes above and beyond his role and provides mentorship in a thoughtful, compassionate and constructive manner. He has demonstrated exemplary skill, patience and kindness, ensuring individuals who consult with him feel valued. The Administrative / Support Staff Award goes to two winners this year. This award was established to honour of the memory of Judith Toderan, former Academic Administration Office Supervisor and Executive Assistant, who passed away in February 2000. 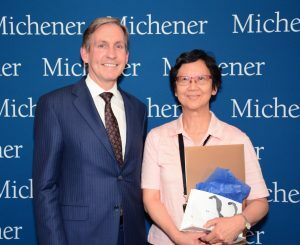 The first recipient of this award consistently stays on top of all activities of the director and faculty and coordinates all the steps in the planning, implementation, and follow-up of three successful programs for Michener. She seeks and welcomes new ways in which she can increase her capacity and enhance her contribution to her team. Congratulations to Manuela Ungureanu! 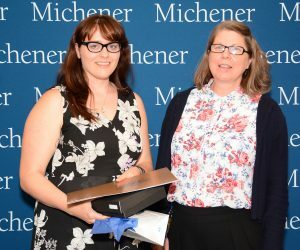 The second winner of this award consistently demonstrates an ongoing ability to improve her skills by consistently looking for opportunities to grow and to enhance her contribution to Michener. Through her help transitioning the Clinical Chemistry, Microbiology and Hematology areas to the new Meditech Laboratory Information System in 2015, her enormous efforts led to a smooth transition to the new test methodology on time for the first days of the summer semester. Congratulations to Lisa Gibbs! The Crystal Apple Faculty Award recognizes faculty for their outstanding contribution to the education of our students and their commitment to education. This year, the nomination was unique. Rather than the award going to one specific faculty member, it is going to the faculty of an entire program. Congratulations to the Medical Laboratory Science Faculty: Aruna Kolhatkar, Elizabeth Officer, Gina Pinkowski, Kelly Ann McPherson, Lisa Rosenberg, Lorinda Ashley, Mary Emes, Michele Allsopp-Downie, Shannon Sutherland, Angela Yim, Erica Gulli, Wendy Pass, Colette Descent, Elizabeth Mercuri and Peggy Kiely. 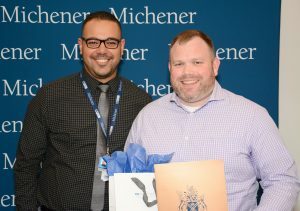 The President’s Award of Excellence recognizes a staff member who demonstrates a significant impact through their work, and who contribute to Michener’s success in transforming health care education; leading in education design and adding value to the overall health care system. This nomination recognizes a very special person for her significant contribution to Michener over the years; she is an unsung hero. Her modesty and composure are traits that may be overlooked at first glance, but these qualities define her as a genuine, analytical individual who is valued throughout Michener for her integrity and dedication. The winner of the 2017 President’s Award is Alice Chow.